Services for Captain Longino will be held February 27th in College Park, Georgia...please see obituary information below. 2364 Rugby Ave., College Park GA 30337-1021 ............ (404) 761-5306. A Celebration of Life Service will be held on February 27, 2017 at 11:00 a.m. at the College Park First United Methodist Church, 3726 East Main Street, College Park, GA 30337. The family will receive visitors at 10 am at the Church.The Reverend Katharine Hinman officiating. James Henry Longino was born in Atlanta, GA to George Franklin Longino, Sr. and Alberta Smith Longino. He graduated from Georgia Military Academy, then entered GA Military College. Jake’s father was Chairman of the Draft Board and saw that all four sons served their Country during World War II. In 1942, Jake completed training in the Army Air Corps graduating with the rank of 2nd Lieutenant. After serving in the Air Force in both World War II and the Korean War, he joined Delta Air Lines as a pilot in May, 1953. Jake loved his 30 years of flying with Delta Air Lines. He also loved spending his free time on Lake Blue Ridge. He lived his dream by flying his Lake Amphibian aircraft up to Lake Blue Ridge and taxiing up to our dock. He was a lifelong member of College Park First United Methodist Church where his strong Faith in Christ was nurtured. Jake met his wife Bobbie Ellis in May, 1953 and they married in 1955 at St. Marks Methodist Church, Atlanta, GA. He is survived by his wife Bobbie Ellis Longino, son Robert James Longino, and Phyllis Ramsey, his sister Helen Dunwody and many wonderful nieces and nephews whom he cherished. Jake is predeceased by his father and mother Mr. and Mrs. George Franklin Longino, Sr., brothers George Franklin Longino, Jr., Ira Thomas Longino and Bert Patterson Longino. Special thanks to Dr. T. Kirkland Garner of Piedmont Hospital and Dr. Amardeed S. Mann and the team of dedicated doctors and nurses of Atlanta Medical Center – South who cared for him with such compassion during his illness. In lieu of flowers contributions may be made to Hospice Atlanta or to Falcon Aviation Academy’s Captain James H. Longino Aviation Memorial Scholarship Fund. 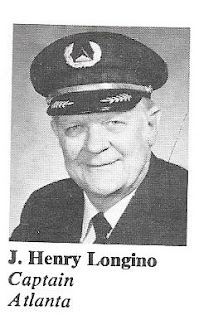 Jake Longino was a Delta Golden Wings Life Time Member. He passed away on 2-23-2017 at the age of 93. His address is 2364 Rugby Ave, College Park, GA 30337.